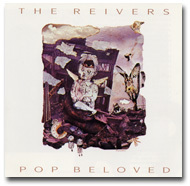 Pop Beloved was the final Reivers album. A combination of things contributed to the breakup of the band. As Garrett says in his interview on this site, it was getting to be less fun and they were having to work at it more. Luckily, they went out in style. Pop Beloved stands with the strongest of their work. To my ears it sounds a little more world weary, a little more experienced than the old Reivers, but no less engaging. “Over and Over” and “What You Wanna Do” are resigned in their outlook, yet “Chinatown” and “Other Side” offer respites from this resignation. As from the first album on, an instrumental or two appears. On Pop Beloved, it’s the atmospheric, very un-pop title track. Despite this piece, the rest of the album is less abstract lyrically than much of their previous output.